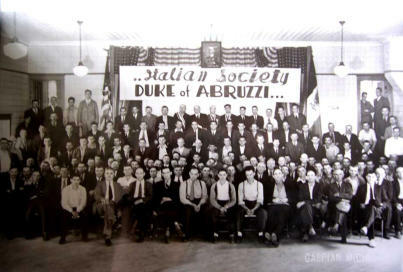 The beginning of one of the oldest organizations in Caspian was the Dukes Degli Abruzzi. This clubhouse had been recognized to be of national importance on the National Register of Historic Places in 1981. 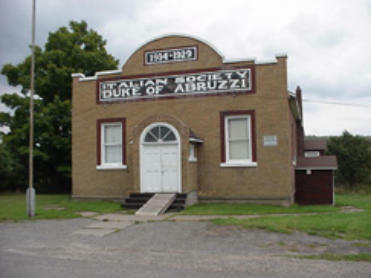 This was one of the Italian mutual benefit associations Duke of Abruzzi created in Italy in the 1870's and was named for the Duke of the province of Abruzzi . He was well known for his military experience in World War II. Any individual born in the region or outside the region of Italy with at least one Italian parent was eligible and was introduced by two members who would recommend him. A vote would be taken by the membership. The Lodge's grandest display of Italian heritage had taken place around the annual Columbus Day celebration. As early as 1914, members met on October 12th, and paraded through town carrying American and Lodge flags. There would be a feast at the clubhouse. This organization was bought by Tony Fittante and his business Tony Fittante Sales. During the summer months, old and young alike meet on the four Bocce courts for summer league play. The public is always invited to watch Duke of Abruzzithe Bocce games on Monday evenings in Caspian. The photo on the left was taken back in the 1930's of all of the then members of the Duke of Abruzzi. If you are from this area, you should be able to identify many of these people who spent most of their livelihoods in the Caspian area. Incorporated in 1968 -- State of Michigan A nonprofit corporation formed for the purpose of promoting and supporting City of Caspian projects. Several fundraisers are held annually to support this cause as well as other area projects. Major annual projects are: • Public Polenta Feed • Operation of the Caspian Ski Chalet • Gifts from Santa raffle and place mats project • Public coffee and rolls on Wednesday mornings The Caspian Progressive Men, Inc. are annual supporters of the Iron County Historical Museum and Museum projects (currently the Toti Tavern moving fund) and the Caspian Athletic Association, a youth community center. A major contribution was made in 2001 to provide the City of Caspian Police Department an AED unit (defibrillator). Annual donations are made to many worthy causes.